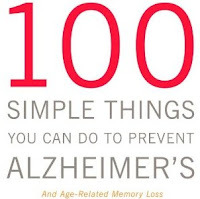 CNN's former medical correspondent has written a book on dementia containing "100 Simple Things You Can Do to Prevent Alzheimer's and Age-Related Memory Loss". Backed by good science, see the author discuss a few of these "100 Simple Things" that help preserve thinking and memory. Most people think there is little or nothing you can do to avoid Alzheimer's. But scientists know this is no longer true. In fact, prominent researchers now say that our best and perhaps only hope of defeating Alzheimer's is to prevent it. We already know many ways to lower the risk. After 70-year-old best-selling author Jean Carper discovered that she had the major susceptibility gene for Alzheimer's, she was determined to find all the latest scientific evidence on how to escape it. She discovered 100 surprisingly simple scientifically tested ways to radically cut the odds of Alzheimer's, memory decline, and other forms of dementia. Even a few preventive actions could dramatically change your future by postponing Alzheimer's so long that you eventually outlive it. If you can delay the onset of Alzheimer's for five years, you cut your odds of having it by half. Postpone Alzheimer's for ten years, and you'll most likely never live to see it. She is a contributing editor to USA Weekend Magazine, and wrote the magazine's "Eat Smart" column for 14 years. She lives in Washington, D.C., and Florida.